Nintendo formally revealed its 3D gaming handheld at E3 2010, and while it didn't show off the glasses-free 3D, it did show off a new Kid Icarus holy crap. 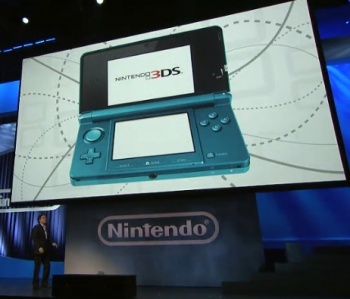 At its E3 2010 press conference, Nintendo closed by showing off something we all knew was coming: The Nintendo 3DS handheld. Nintendo boss Satoru Iwata stressed that the device's top screen would feature full 3D without the need to wear awkward glasses or buy thousands of dollars of hardware. While Iwata did not show off any of the 3DS' 3D display (understandably so - how do you make it look good for everyone viewing on a 2D screen at home?) he did state that it would have always-on WiFi, and claimed that it would have the most third party support of any Nintendo console at launch. He also revealed a very old friend: The lone angel Pit, main character of Kid Icarus - yes, that's right. There will be a new Kid Icarus at launch. Other developers and franchises that have signed on to the 3DS include Kingdom Hearts (Square Enix), Resident Evil (Capcom), Saints' Row (THQ), and Metal Gear Solid (Konami). The 3DS will also play 3D movies, like How To Train Your Dragon - but will it play Avatar? We'll know how well it works when we visit the Nintendo booth later this week. It's worth mentioning that despite the name, Nintendo has stressed that this is not just another DS, like the DSi or Lite. This is entirely new hardware like the DS was to the Game Boy Advanced - it just happens to have a familiar shell thanks to backwards compatibility with DS titles.